The Elegant Themes Builder is a plugin that provides some incredible tools for structuring the content on your page. The plugin creates a visual drag-and-drop canvas where you can add, arrange and re-size advanced elements on your page. This builder appears below the normal text editor when you create a post or page, creating a unique canvas for each. The builder allows to you quickly create columns, sliders, tabs, buttons, toggles, boxes and so much more. We insure that all of our themes are compatible with the most popular internet browsers. It’s important that your website performs well for everyone that visitors it. Never touch a line of HTML again and never deal with tons of messy shortcodes. With the Elegant Themes Builder, you can create beautiful layouts through our advanced visual editor. ElegantBuilder comes with some great elements that you can add to your posts and pages. We put a huge amount of effort into providing quality tech support to our customers. With dedicated support staff at your back, you can be sure that you will get your blog up and running without a hitch. 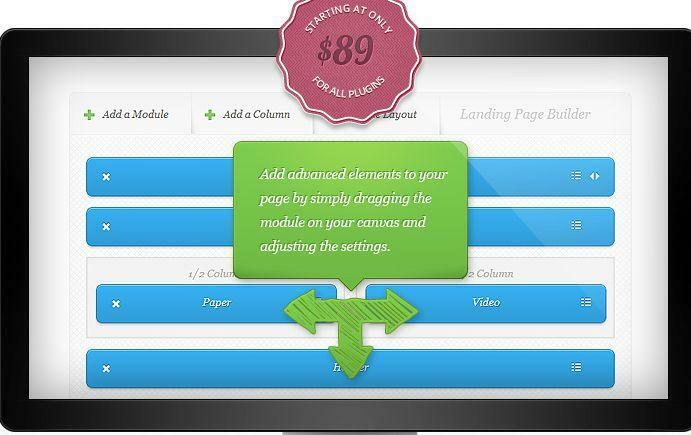 ElegantBuilder comes powered by our intuitive drag and drop page builder. This module-based system allows to you build your page visually without ever having to touch a line of code or deal with a sea of messy shortcodes. Drag your modules onto the canvas and re-size and rearrange them quickly and easily with your mouse. You can create advanced layouts using columns and nested elements, as well as integrate widget ready sidebars and plugins. ElegantBuilder gives you a completely new set of tools for creating and managing your content. Share the post "Drag and Drop Builder Plugin"